What are semi-automatic washing machines? The most common semi-automatic washing machine model is the twin tub model. One tub is dedicated for the washing of clothes, while the other is for spinning the clothes and drying it out. In these models, the amount of water to be filled in the machine is manually controlled by the user by adjusting the flow of water at the faucet. The outer shell of the machine is usually made out of plastic. This ensures that the machine never rusts. 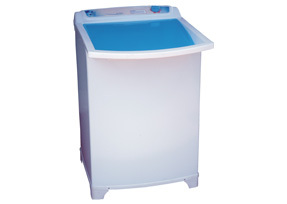 Newer models come with transparent top lids that ensure that you can keep an eye on the clothes as they wash or spin without actually stopping the machine and opening the lid. Collect your linen in a place and do a wash cycle at once. This will ensure that the capacity of the machine is utilized optimally. Setting the temperature of your washing machine to 40˚C instead of the more common 60˚C setting will ensure that you save up to a third of electricity. Fill clothes in the wash drum and turn the water faucet on. Manual supervision is required to ensure that the machine is filled up to the right level. A timer knob is then set to determine for how long the drums agitator motion runs to wash the clothes. Once the clothes are washed, the drum needs to be manually drained and refilled to rinse clothes. Once the clothes are suitably rinsed, it is transferred to the spin tub so that excess water can be wrung out of the clothes. Care needs to be taken to ensure that the drum is not overloaded as it is likely to become unbalanced. A common disadvantage with most semi-automatic machines is that the spin chamber is considerably smaller than the overall capacity of the machine. This means that only some clothes can be spun at a time. The advantage of using a semi-automatic washing machine is that, since a person is constantly vigilant about the water level, the machine consumes and reduces wastage of water during the entire wash process. When buying a washing machine check the machine’s wash load. The wash load is the capacity of clothes that the machine can handle. The average capacity of a semi-automatic machine is 6 to 8 kg. Look for machines that are energy efficient. Some machines have energy efficient motors that ensure that the machines not only consume less amount of electricity but also are considerably more silent while operating.